ZE-936 R&E Rare Hummingbird Passage Door Knob Replica 2 1/4"
This is the passage (interior) door sized hummingbird door knob by R&E, produced in 1880. The detail and composition of these knobs is simply stunning. 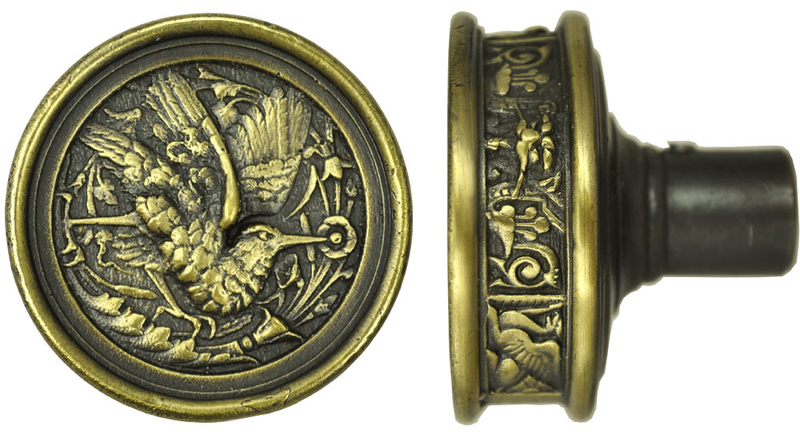 Note the fine detail cast on the side of the knob, which feature mythological griffins. Our reproductions have been taken directly from the original antiques. We cast in solid brass, then darken to an "antique" patina, and lacquer to preserve the tone. Unless you reveal the secret, friends will think you've found an original antique. This doorknob is sold by each. To make a set, order two doorknobs and connecting spindle shaft . 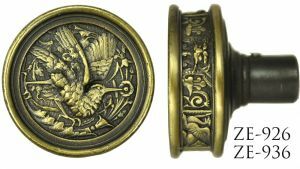 This doorknobs was originally shown in the 1870 catalogue with the R&E Bird Motif door plate pictured here also. This rare knob is also available in the exterior door size . This doorknob would also work well with our Windsor pattern, a staple inhigh end Victorian homes. There are Windsordoorrplates in several sizes, or Windsordoorrplatewith turnlatch (pictured here also). Knob measures 2 1/4" in diameter and projects by 1 7/8".